Lunch: We ate at Santouka Ramen in the Mitsuwa in Culver City (3760 South Centinela Avenue, Los Angeles, CA‎ - (310) 391-1101‎). I've eaten at the Santouka Ramen in San Jose and thought it was excellent, so I wanted Tina to taste it. The Los Angeles location is just as good and with four people we got to try several different types. 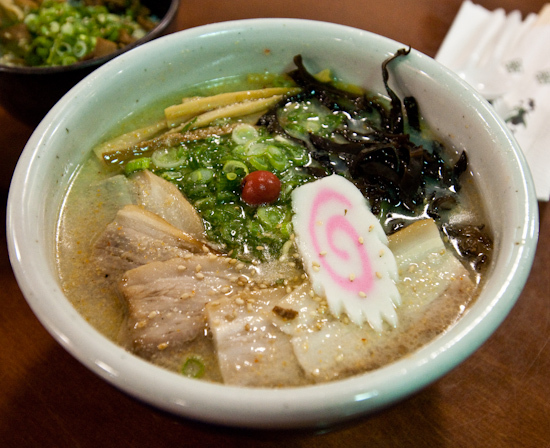 Salt Ramen - pork soup seasoned with salt. This was the least salty of all the soups - best for people who prefer their food on the milder side. Shoyu / Soy Sauce Ramen - pork soup seasoned with soy sauce. This is a little more salty than the salt ramen. I thought this had the best tasting soup for drinking (after you are done eating the ramen). Miso Ramen - pork soup seasoned with miso. This has the added taste of fermented soy beans, but may be a bit strong when drinking the soup. 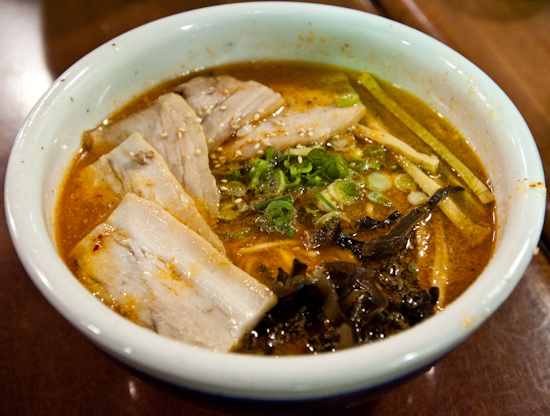 Spicy Miso Ramen - pork soup seasoned with miso and chili sauce. 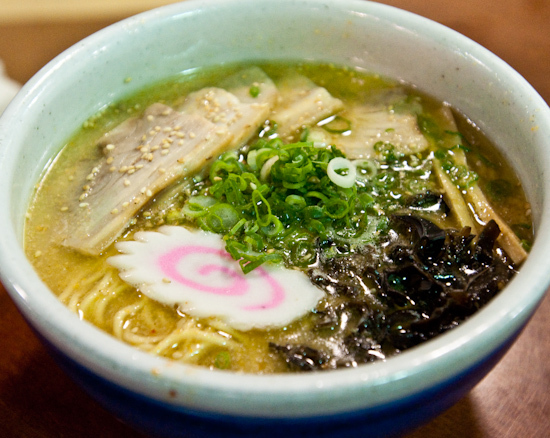 This is the most flavorful of all the ramen, but the soup may be a little challenging to drink without ample amounts of water (the spiciness is flavorful but fairly mild - it's the extra saltiness that requires drinking water). 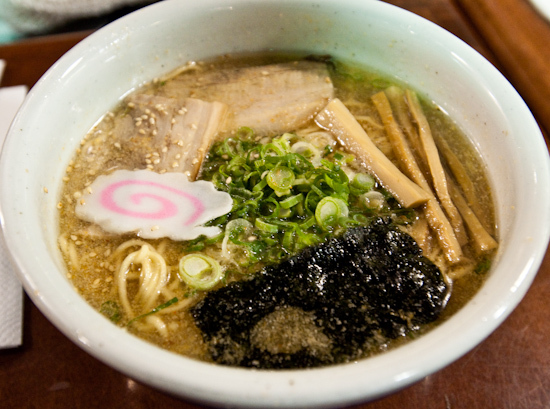 All the ramen pictures except the shoyu ramen show them with extra pork (chashu). 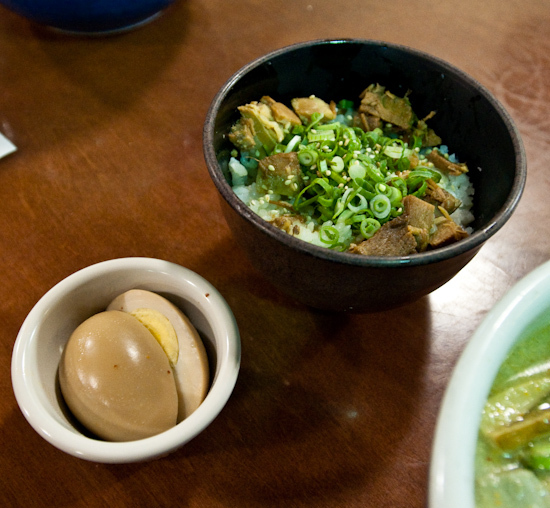 We also had an egg and pork on rice. The pork was flavorful and delicious on the soft rice that soaks up the juices from the pork. 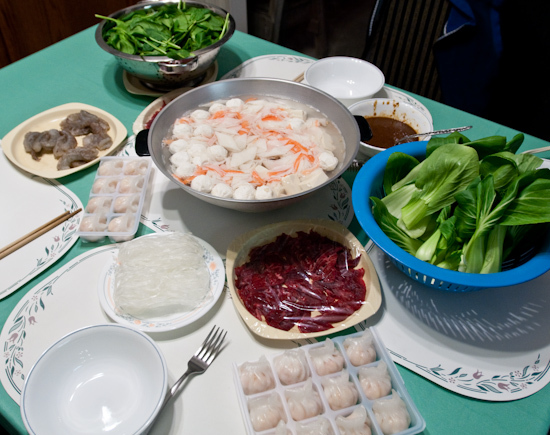 Dinner: We had a family dinner at home eating hot pot. i just went to la with my boyfriend to visit his sister, and we were blown away by that japanese shopping center!! so glad i can follow you eve when i'm on vacay from austin, haha. I love Santouka! Glad you finally got your Ramen fix. I think we went to the same one in the food court of that Japanese grocery store right? I really loved the miso one, will have to get the regular shoyu flavor next time per your recommendation. It seems they are always in the food court of a Mitsuwa - the Santouka I went to in San Jose was also in a Mitsuwa (I got my ramen fix in January when I had to make a business trip out to California). This one was similar but the lines were shorter than in San Jose. I'm glad that Tina got to try their ramen, and we tasted four different broths!